They collected the Outstanding Contribution To Music gong at last month’s Brit Awards – that greatest hits medley was quite something, right? 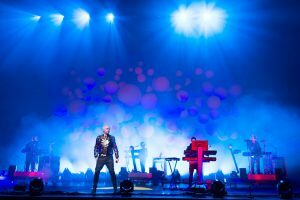 – but Pet Shop Boys aren’t ready to pack away their synthesisers just yet. In fact, the grand old dukes of electropop have just recorded an album with Xenomania, the songwriting/production team behind Girls Aloud’s record-breaking run of hits. Intrigued and excited in equal measure, we gave Neil Tennant a call to find out more. Your new album’s been produced by the Xenomania team. Who approached who? What’s the Xenomania setup like exactly? Are you anxious about how the album’s going to be received? You’ve described ‘Love etc.’, the lead single, as a ‘post-lifestyle anthem’. What do you mean by that phrase? Have you thought about the second single yet? Is ‘Pandemonium’ a potential single? What happened with writing songs for Madonna? You also had a hand in writing ‘The Loving Kind’, the last Girls Aloud single. Was it originally meant to be a Pet Shop Boys track? Will you ever record it do you think? These days you’re often referred to as the ‘elder statesmen of pop’. What do you think of that description? Whose idea was it to involve Brandon Flowers and Lady GaGa in your Brits performance? What was she like to work with? Are you pleased with how the Brits performance came off?